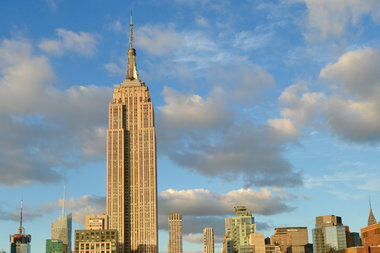 Sean Riddle, 27, was arrested on Feb. 4 for crashing his drone into the Empire State building. MIDTOWN — The New Jersey man who smashed a drone into the side of the Empire State Building last month got off the hook with community service and a fine after taking a plea deal, prosecutors said. Sean Riddle, 28, pleaded guilty in court on Monday to disorderly conduct, taking a deal that reduced the charge from a misdemeanor count of reckless endangerment, according to a District Attorney spokeswoman. He must complete two days of community service before May 9, and pay a $200 fine along with a $120 court fee, and he has to keep his nose clean for a year as part of the terms of the deal, according to his lawyer, Joe Robinson. Riddle ran afoul of the law on Feb. 4 when he crashed his remote-controlled aircraft into the 35th floor of the skyscraper at around 8 p.m., which sent it careening down to a ledge on the sixth floor, according to police and prosecutors. Riddle approached a security guard in the lobby of the 85-year-old landmark, who called police instead of helping him retrieve the drone, officials said. The errant pilot told police that he had been filming a video for an alumni group of his alma mater, the University of Kentucky, when he lost control of the drone due to wind, according to a criminal complaint. Prosecutors initially charged Riddle with reckless endangerment and pilot intoxication, but he apparently received a lighter sentence in part thanks to accidentally turning himself in. If he had not tried to get his drone back he most likely would not have been caught, the prosecutors said. Riddle’s drone debacle never put anyone in harm’s way, according to prosecutors. Robinson, whose law firm Callahan & Robinson regularly works with drone companies, thanked prosecutors for going easy on his client.